Trouble of any kind can be difficult; even the mentioning of the word ‘trouble’ evokes unpleasant feeling or thought. No one, all things being equal, wants trouble and yet it comes. It comes without regard for our schedules or plans; it comes without regard for our health or well-being. In a sinister way it mimics the children’s game of ‘hide and seek’; “ready or not, here I come.” It sometimes offers us the variety package where there may be an assortment of issues, all at the same time; and just when we think that we have a handle on them some get worse. David, in I Samuel 3:1-9, provides us with great insight as it relates to managing issues that have become cumulative in nature and are demanding our response. I Samuel 3:1-9 – Now the boy Samuel ministered to the LORD before Eli. And the word of the LORD was rare in those days; there was no widespread revelation. 2 And it came to pass at that time, while Eli was lying down in his place, and when his eyes had begun to grow so dim that he could not see, 3 and before the lamp of God went out in the tabernacle of the LORD where the ark of God was, and while Samuel was lying down, 4 that the LORD called Samuel. And he answered, “Here I am!” 5 So he ran to Eli and said, “Here I am, for you called me.” And he said, “I did not call; lie down again.” And he went and lay down. 6 Then the LORD called yet again, “Samuel!” So Samuel arose and went to Eli, and said, “Here I am, for you called me.” He answered, “I did not call, my son; lie down again.” 7 (Now Samuel did not yet know the LORD, nor was the word of the LORD yet revealed to him.) 8 And the LORD called Samuel again the third time. So he arose and went to Eli, and said, “Here I am, for you did call me.” Then Eli perceived that the LORD had called the boy. 9 Therefore Eli said to Samuel, “Go, lie down; and it shall be, if He calls you, that you must say, ‘Speak, LORD, for Your servant hears.’” So Samuel went and lay down in his place. 1. Appropriate expressions at appropriate times are appropriate. I Samuel 30:4 – Then David and the people who were with him lifted up their voices and wept, until they had no more power to weep. • Weeping at appropriate times is appropriate. • Wholeness is owning all of who you are. • Weeping is a response of great value. 2. Decide to be a positive influence in your challenge. I Samuel 30:6 – Now David was greatly distressed, for the people spoke of stoning him, because the soul of all the people was grieved, every man for his sons and his daughters. But David strengthened himself in the LORD his God. David did what no one around him was doing; he became a positive influence in the challenge. Dr. Barbara Fredrickson – Psychologist and Researcher in her book “Positivity” wrote that positive emotions are important for resiliency and for being able to better deal with negative situations and setbacks. In her research she has found that positive emotions enables you to think more clearly and more creatively about how to handle and deal with problem situations while negative emotions as a rule tend to constrict and limit your creativity and problem solving capabilities. She also found that positive emotions tend to promote positive actions and behavior while negative emotions promote the opposite. 3. Put on your garment of praise. I Samuel 30:7 – Then David said to Abiathar the priest, Ahimelech’s son, “Please bring the ephod here to me.” And Abiathar brought the ephod to David. • Some challenges require you to praise your way out. 4. 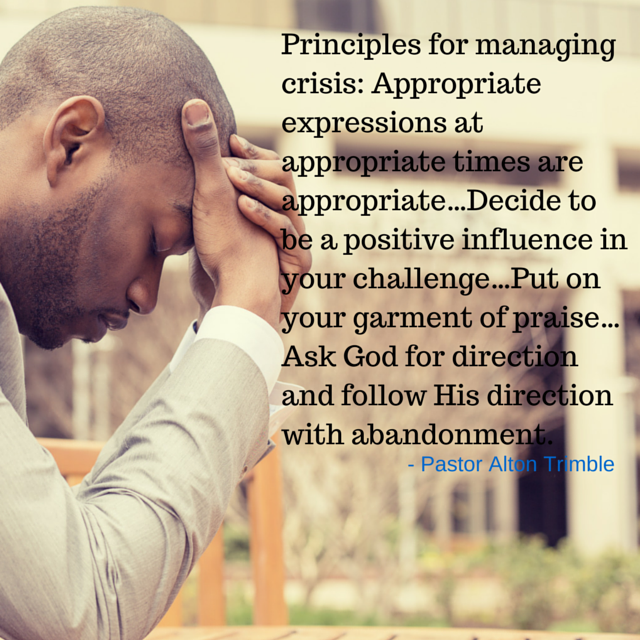 Ask God for direction and follow His direction with abandonment. I Samuel 30:8-9 – So David inquired of the LORD, saying, “Shall I pursue this troop? Shall I overtake them?” And He answered him, “Pursue, for you shall surely overtake them and without fail recover all.” 9 So David went, he and the six hundred men who were with him, and came to the Brook Besor, where those stayed who were left behind. Psalm 27:1-5 – The LORD is my light and my salvation; whom shall I fear? The LORD is the strength of my life; Of whom shall I be afraid? 2 When the wicked came against me to eat up my flesh, my enemies and foes, they stumbled and fell. 3 Though an army may encamp against me, my heart shall not fear; though war may rise against me, in this I will be confident. 4 One thing I have desired of the LORD, that will I seek: that I may dwell in the house of the LORD All the days of my life, to behold the beauty of the LORD, and to inquire in His temple. 5 For in the time of trouble He shall hide me in His pavilion; in the secret place of His tabernacle He shall hide me; He shall set me high upon a rock. My friend, meditate on these principles; start at the top and work your way down and as you do, EXPECT GOD TO MOVE! I love it, we must see the unseen! It’s already done! I have been through many crises throughout the past several years, but no one would know because my response was to give praise and thanksgiving instead of walking around moping. I’ve learned that it’s all about how you respond to a crisis. God doesn’t want to see His children distressed, but sometimes things are permitted to happen in our lives. God knows we can handle it and knows we will come out on the other end of the valley with a testimony and a praise. I have often found that a good cry brings liberty, a release, a cathartic experience. But then I must get up and get ready to hear from the Lord and get my praise on; because praise confuses the enemy. I often wear a button not given to me by the church but from my God Mother that says I am Allergic to Negative People. It is so important not to allow the negativity or brokenness of others be projected on to you. The bible says to guard your heart, for everything you do flows from it (it determine the course of your life NLT) Provb 4:23. No matter what is going on, find a way to move forward everyday with positive emotions not giving foot to the enemy to come in. Confessing what The word of God says and not your committee. I thank the Lord that He left us a Comforter, the Holy Spirit, so just as David called upon Him we can also, through the storms, trials, and tribulations life brings us. And because of that we have the ability to have a Peace thru it all. Weeping may endure for a night, but Joy comes in the morning….when is the morning? When ever we say it’s the morning! One of the definitions for morning is: “beginning or early period”. Each new day that we wake up with new mercies we can experience the duality of morning. It’s a new beginning to think new thoughts. Decide to be positive in spite of your situation. As PT said, put on the “Garment of Praise” and keep moving forward. Positivity begets positivity and when we choose to go fourth in praise and purpose, Elohay Mauzi – God Of My Strength: (Psalm 43:2), will rise up in you and give you strength for the journey! Thanks God for you P. T.
The growth of a saint is the work of a lifetime.we love our glory family& Pastor P.T. Is the best.